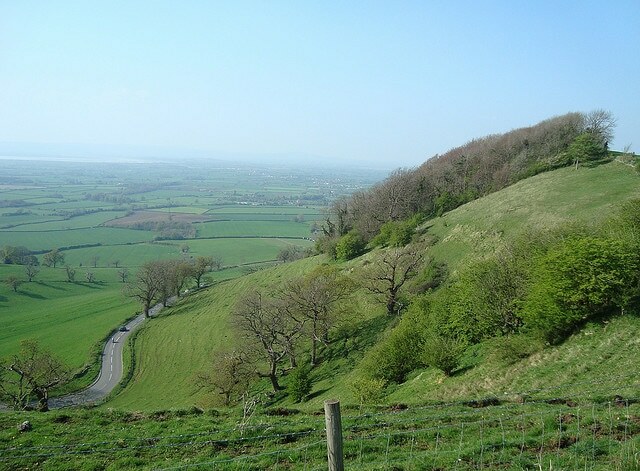 Frocester hill is a great climb on the edge of the Cotswolds. It climbs from the flat lands of the Severn valley up towards Nympsfield and Uley. It affords great views from the top looking towards Wales. Another advantage of the climb is that it is well engineered – offering a very steady gradient averaging around 9%, but nothing steeper than 11 or 12%. It allows you to get into a good rhythm – the real test is the length of the climb – it is longer than many English climbs, and gives a little taster of what climbs are like in the Pyrenees. The full climb starts in the village of Frocester, but for the first 0.7 miles, climbs at only 1 or 2%, but then the road unmistakeably rears upwards, and there is a long slog to the top of the hill. From a hill climbing perspective, it would make an ideal hill for an everesting attempt because the gradient is constant around that magic gradient of 10%. The only drawback is that it is just a little busy to be doing 300 u-turns in the middle of the road. It’s not as busy as many roads. But, when you imagine doing a u-turn at the bottom of a fast descent, you realise how difficult that is. I have ridden Frocester hill twice. Once was during a long ride from Oxford (200km). The second time was in the middle of the Bristol South CC Megahilly, which takes in five major climbs around that area. It is really a fantastic time trial and highlights the variety of testing climbs in this part of the world. I was on my time trial bike, which is not idea for climbing Frocester hill, but not that much slower because although it is heavier, you can still do the climb in the saddle.